HelIo! My name is Scott Burnett and I am a Disney fanatic! I was born and raised in the Birmingham area of Alabama. I continue to live in the Birmingham area with my wife and three children. I have taught physical education on the primary level for over a decade. I began planning vacations for family and friends since I enjoyed keeping up with the latest travel and vacation deals and since I am known as the Disney geek among family and friends. As a child, family vacations made lasting impressions on me. Disney World, Bush Gardens, Gatlinburg, Washington DC, Williamsburg, and more are memories with my family that will stay with me forever. I loved the excitement and build-up of a coming trip almost as much as I loved the trip. Now as an adult, I get to choose for myself the trips I take, and I love helping others do the same. I often tell others of the three most worthwhile choices I have ever made. First and foremost is my relationship with Jesus Christ. Speaking of “forever,” He has given me life eternal along with abundant life now. Part of that abundant life has been mission and ministry opportunities that have taken me across lands and oceans to places like Costa Rica, Jamaica, and Ecuador. My second most worthwhile choice is my marriage to my beautiful wife. We’ve been blessed with three wonderful children–an eight year old, a six year old, and a nine month old. As a husband and father, I have had many opportunities to plan vacations for my family. 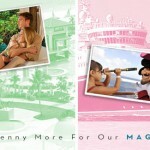 Before children–Disney World, hot spots in the Southeast, Sandals Jamaica, Washington D.C., England, and a Western Caribbean cruise. After children–Disney World, Disneyland California, hot spots in the Southeast, Hilton Head, Vero Beach, and a Disney Cruise. Many more destinations are on my vacation dream list including the Grand Canyon, Alaska, Hawaii, Disneyland Paris, Disneyland Tokyo and Hong Kong, and more. In between my own vacations, I would love to help others make memories for a lifetime by planning theirs! Email me and let’s get started! What do clients say about Scott? Scott invites his current and previous clients to share their own experiences working with him. Please email your testimonial and include a photo from your trip if you can!